It is November 2nd. That’s two days after Halloween, twenty-four days before Thanksgiving and fifty-one days to Christmas. In other words, it’s way too early for me to be seeing Christmas ornaments and snowmen peeps on the shelves (anyone else remember when peeps were a seasonal treat?) The leftover Halloween candy has barely made it to the sale racks, and you’re pushing Christmas knick-knacks already? Have you forgotten that there’s an entire other holiday in between Halloween and Christmas for which you could be selling tacky and unnecessary kitsch? Also, wherefore your sudden and mysterious aversion to beans? What used to be a plentiful variety and stock of beans – red beans, black beans, kidney beans, great northern beans, garbanzo beans – has shrunk to a paltry and elusive collection. I think I bought the last two cans of black beans in the store. To say nothing of the butter shortage. I kind of (but not really) understand having a run on butter around Thanksgiving or Christmas what with all of the baking, but Halloween? Who runs out of unsalted butter on November 2nd? In other news, I moved Dinner to Tuesday night this week because, let’s face it, everyone I know was going to be glued to their TV all night watching the returns come in anyway. I figured we could at least watch them all together and provide each other with moral support as we bit our nails and agonized over every single electoral vote. I would like to say that we as a community have lost our sense of delayed gratification. We can’t wait for peeps once a year any more, we have to have them for every holiday (and apparently now in flavors, which is just wrong). 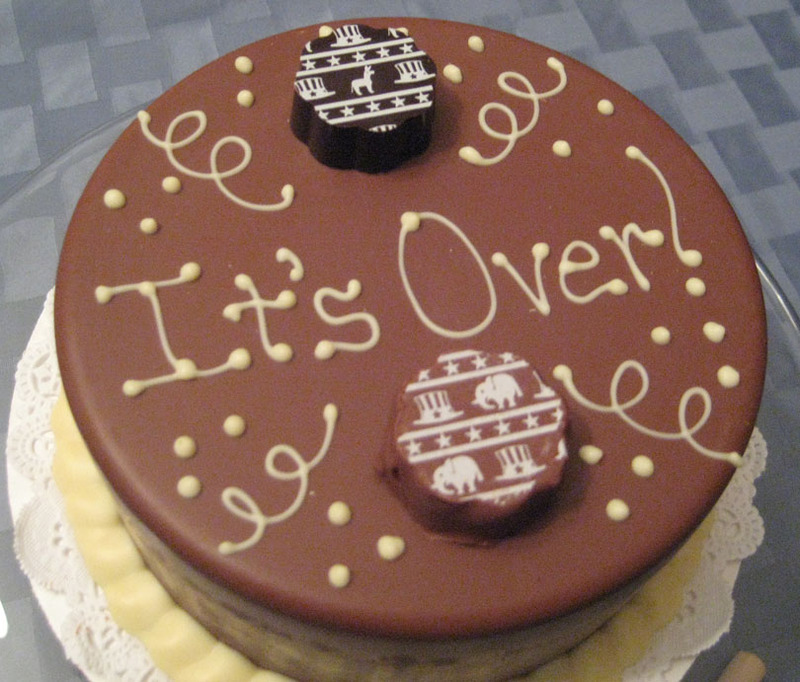 On the other hand we finally got to the end of a 22 month electoral campaign so possibly our sense of delayed gratification is fine, we’ve just been saving it for bigger things than when peeps get stocked. * Why? Because it sounds so much snider in French. Here’s hoping I spelled everything right. I know someone who was planning an election night party where the theme was the food of the liberal elitists. He was going to serve arugula salad, brie, sushi, and open bottles of chardonnay. I contemplated this, but made chili instead as much for the sake of practicality as anything else. 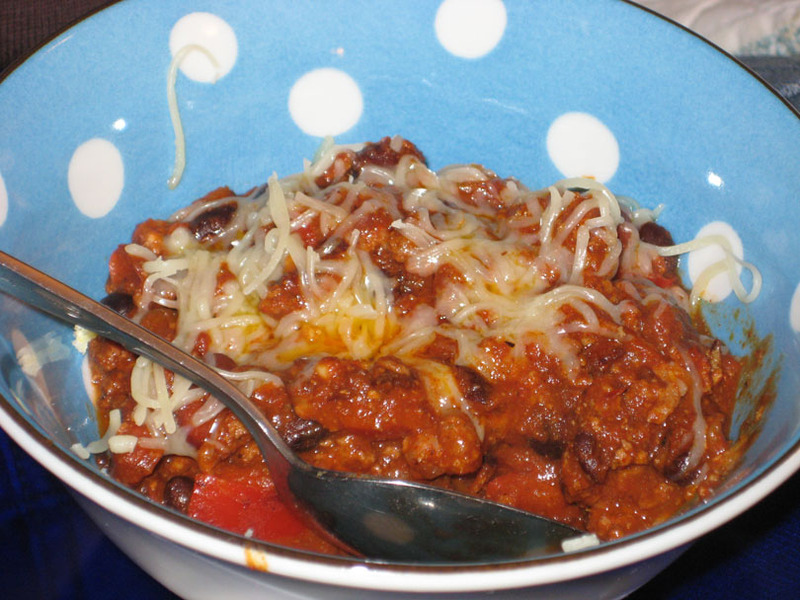 Chili is easy to make for a crowd and it holds well if not everyone is sitting down to eat at the same time. People kept turning up throughout the night as they got done voting, got back from play rehearsals, were finished with seminars . . . . I just kept the pot of chili on the stove over low heat and people could serve themselves as they got there. Other people brought the dessert and alcohol we felt were going to be necessary to quell our nerves as the results started to be announced. Serves about 8-10 and will make your house smell amazing. Pour your cider into a large pot and set over medium heat. Juice two oranges and add to the cider. 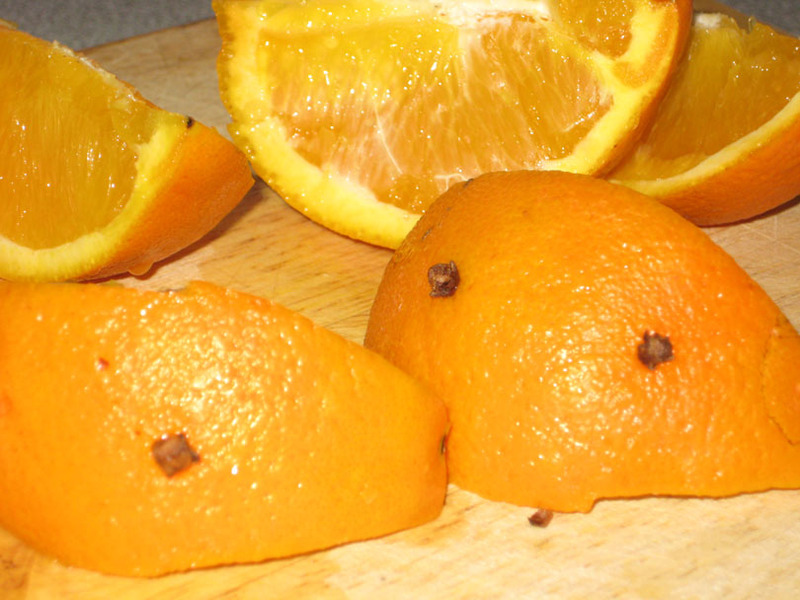 Cut the remaining oranges into sixths and stud with cloves, two per slice (up to 8 cloves, or to taste). It’s hard to push the clove stem through the orange peel, so I usually poke a hole in the orange peel with my nail or the tip of a knife and insert the clove stem into that opening. Add to the cider. Add the cinnamon sticks and allspice (if you don’t have whole allspice berries lurking in your cabinet don’t run all over creation to find them, they’re a nice addition but not necessary). 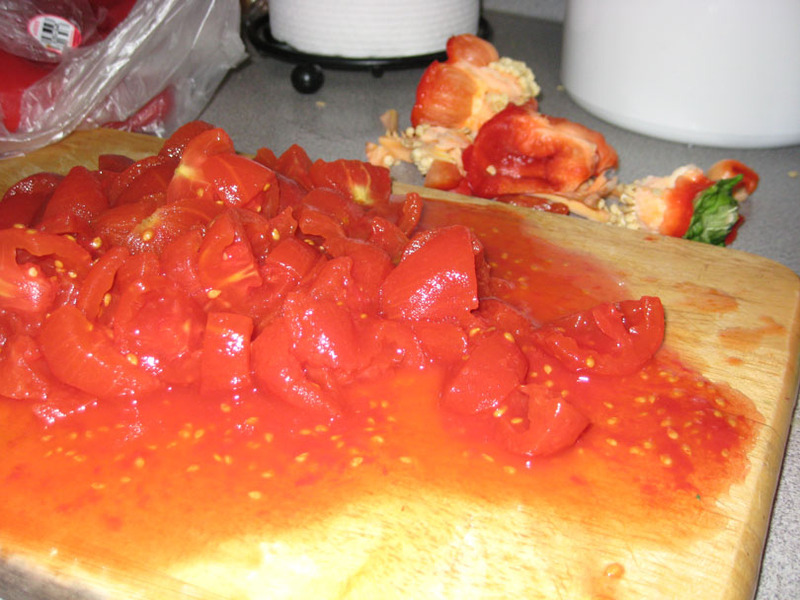 Allow to come up to a simmer, and then lower the heat as far as you can. The longer it simmers, the better it gets. It’ll come up to a simmer faster with the lid on, but your house will smell better with the lid off. If it’s been that kind of a day you can add a splash of rum to your cider, and that’ll make everything seem a little better. I have a really good sausage chili recipe that calls for kielbasa, but I suppose there’s no reason you couldn’t use turkey sausage instead. Let me know if you ever want to try something a little different. Pardon for those of us who have not lived in America for years, but what are peeps? And why is it wrong for them to come in flavors? Peeps are sugar coated marshmallow creatures. Originally they only came in chick and rabbit shapes, but now you get cats and snowmen and many many other things, and they come in chocolate versions now too. The real question is do you eat them fresh out of the box, or do you wait patiently for a week for them to get stale before you eat them? Ah yes. I never knew they had a name. Even in the dark ages in my childhood we had the chicks–vivid, glow-in-the-dark yellow. I always favored them stale. Good to know I get it honestly. I also prefer them stale. I will in fact open a box and then hide it so that nobody who likes them fresh can get to them before they reach the appropriate state of staleness.